I found myself with an entire week off from work between Christmas and New Year's without any travel plans (unused paid time off days are lost at the end of the year at my company). I started to think of some home organization projects I could take on during those days. You know..... the tedious, boring kind. The kind that don't involve my craft room. 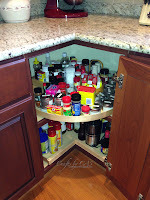 Funny how I could organize my crafty corner of our house until the cows come home, but when it comes to the garage, pantry, linen closets or even the cabinet where I keep our spices, I stiffen up and dig my feet into the ground. 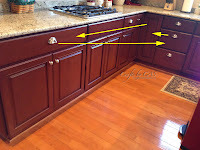 Here is a picture of where we used to house our spices. It's corner cabinet with a built in lazy susan, and it is difficult to find anything you are looking for without other items falling over. Even if I purged some spices and cleaned out the cabinet, it still wouldn't be an optimal place for our spices. I decided to move them to a large, wide drawer located left of our stove where we keep our (many) kitchen towels and take out menus. The towels and menus would be moved to a smaller, deeper drawer and the items in that drawer will go where our spices were originally kept. Are you following all of that? I purchased Round Metal Tins from Papermart in the 8 ounce size. 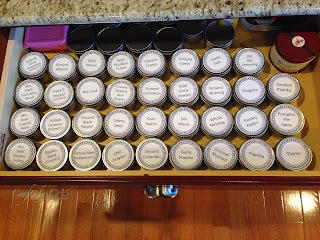 Since the lids I purchased were solid and the new home for my spices is a drawer, I decided to make a label for the tops. I found the round frame design online and used Powerpoint to insert the spice names in the middle of the frame. 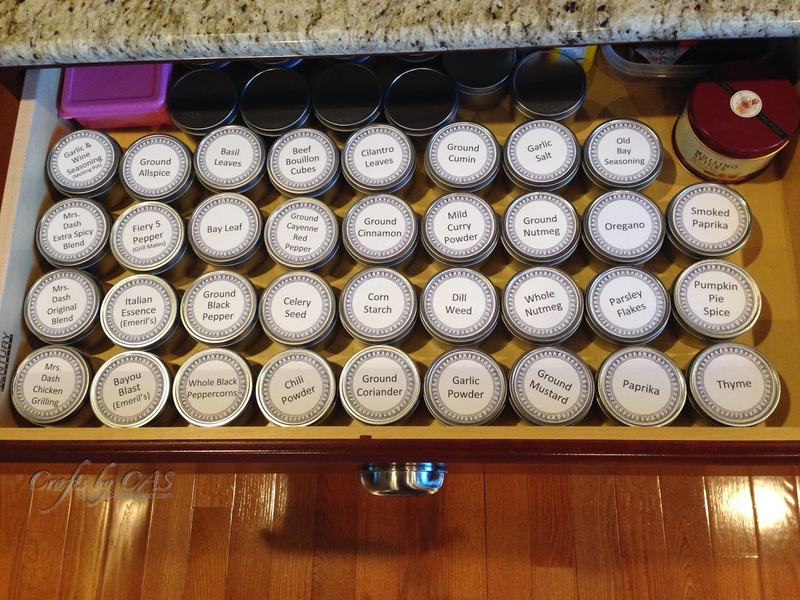 I printed the spice label out on full sheet labels from Avery and cut the circles out using a Nestabilities circle die and my new Vagabond machine. 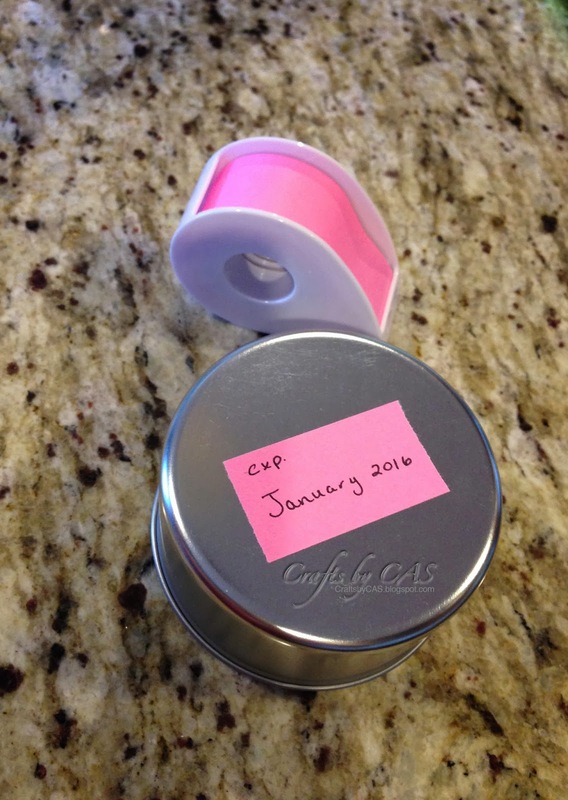 To help me with this in the future, I decided to place the expiration year on the bottom of each tin using Post-it adhesive roll (my new favorite thing). I'm not sure if this post was 100% 'non-crafty'.....but when I have to complete a task that isn't all that interesting, bringing office or craft supplies into the mix helps me carry on.